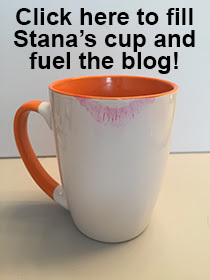 Very sound and sage advice, Stana! Good for you!! I agree. Stana - Great reply - I am now at a stage in my femme- self that I am just like you. "Better read than dead" ... I love this line, but it is certainly double-edged, isn't it? As seen in the recent rash of trans-killings and bashings after the women (presumably) were read. In my more limited experience, I am sure I've been read, but I don't notice it much. I assume some day I will, though, and hope I react as well as you do, flashing that killer smile. My experience with being "read" is that no one seems to really care. Maybe 10 years ago this might have been a bigger issue but in these "PC" times we live in it seems to be getting easier. At Least thats' what I find. Quick PS: Wasn't the George Harrison HBO doco great? Thank you, yet again, for sharing your insights and adventures here, for those of us who need to live their feminine lives vicariously through you. I definitely do not have the figure to pull off "passing," and also do not have the time and/or dedication to do so right now. Once, at a mall, a woman pushing a stroller kept looking over her shoulder, staring (and glaring) at me. Eventually, I gave her a huge smile and a big wave and I only saw her backside after that. The smile is our greatest come back. It's not only disarming it's welcoming. Plus it's one of the prettiest assets we have. A smile on our face, in our look, in our presentation and our demeanor will almost always tell people that we are not a threat, we are confident in our lives and we will create that feeling in those who are open and welcoming (people really are) that we are the image they are seeing, a presentation of femininity, thus to be considered female. It's been my experience, that when you are in Rome and you do as the Romans do, and even thought it may be known that you aren't a Roman, that you won't be thrown to the lions. When you do things with care and respect for others, you will receive as much in return. "when you are in Rome and you do as the Romans do." Bravo. Words to fully, gorgeously live by. Being the wife of a crossdresser and being out and about with them- I noticed a lot of looks from passers by. My partner did not; this was because they were like so many, self absorbed in the activities they were doing. Becareful all of you as you maybe only picking up a fraction of the 'looks' comments etc. Be mindful that alot of folks can be defensive if confronted even by a smile. Unfortunately the world in general doesn't want to understand anything that isn't in their own interests - no matter what group or walk of life they are from. I sometimes notice women I think might be trans, because I'm trans too, only I'm not out. I don't mean to stare, but I'm usually so thrilled to see someone sort of like me (someone braver than me obviously)! I just try to smile and not make them uncofmortable, but I'm always worried I've made a sister uncomfortable.